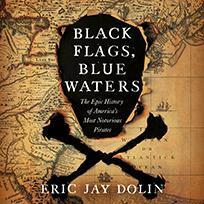 Set against the backdrop of the Age of Exploration, Black Flags, Blue Waters reveals the dramatic and surprising history of American piracy's "Golden Age"—spanning the late 1600s through the early 1700s—when lawless pirates plied the coastal waters of North America and beyond. Bestselling author Eric Jay Dolin illustrates how American colonists at first supported these outrageous pirates in an early display of solidarity against the Crown, and then violently opposed them. Through engrossing episodes of roguish glamour and extreme brutality, Dolin depicts the star pirates of this period, among them towering Blackbeard, ill-fated Captain Kidd, and sadistic Edward Low, who delighted in torturing his prey. Also brilliantly detailed are the pirates' manifold enemies, including colonial governor John Winthrop and evangelist Cotton Mather. Upending popular misconceptions and cartoonish stereotypes, Dolin provides this wholly original account of the seafaring outlaws whose raids reflect the precarious nature of American colonial life. Eric Jay Dolin is the bestselling author of Leviathan and Brilliant Beacons. He and his family live in Marblehead, Massachusetts, from which the pirate John Quelch departed in 1703, and returned to in 1704, only to be hanged in Boston.